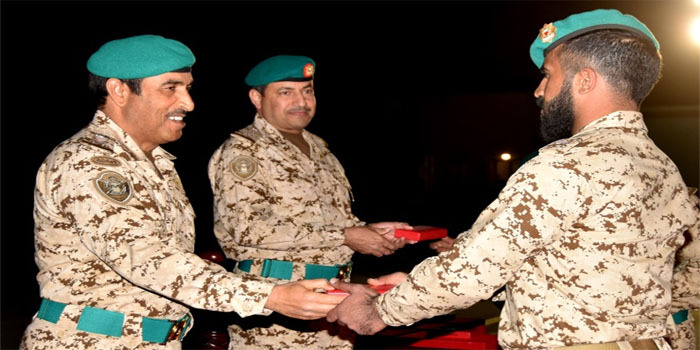 A ceremony was held this evening in honour of the Bahrain Defence Force (BDF) taskforce taking part in the Operation Restore Hope in Yemen, as part of the Saudi-led Arab Alliance. The ceremony was held at the Isa Airbase under the patronage of Royal Guard Commander Major-General His Highness Shaikh Nasser bin Hamad Al-Khalifa. Royal Guard Deputy Commander Major-General Hamad Khalifa Al-Nuaimi welcomed the BDF contingent and handed them medals, conferred by His Majesty the King, the Supreme Commander on the taskforce officers, non-commissioned officers and servicemen in recognition of their patriotic efforts and fraternal role alongside their brethren, as well as the combat spirit, professionalism and discipline in performing their lofty mission. The ceremony was attended by senior BDF officers and families of the servicemen taking part in the BDF taskforce.